If you've visited our restorative dentistry page, you already know that Larry Young Dental offers a wide range of effective services, like porcelain crowns, fixed bridges, and dental implants. What you may not know is how our office gathers the information we need to design your treatment. Many offices still rely on physical impressions to plan patient care and design restorations like porcelain veneers, crowns, inlays, onlays, and implant abutments. 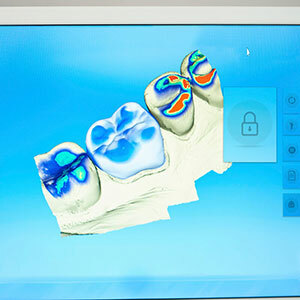 But at Dr. Young’s Jacksonville dental office, we recently acquired a newer, more accurate and quicker iTero, a revolutionary new tool, to create completely digital impressions. As with traditional impressions, digital impressions exist to give Dr. Young a clear image of your smile that he and our lab can work with to deliver better care. A key difference between them is that taking an impression with iTero is more comfortable for patients and can be completed in a matter of minutes. What’s more, a digital impression can be easily changed before it is sent to our lab, where a model of your smile, or your restoration itself, will be carefully crafted.